Nader earned his law degree from Harvard in 1958 and while working as a consultant to the U.S. Department of Labor, published in 1965 Unsafe at Any Speed, which assaulted the U.S. auto industry for sacrificing safety to profits. The book made Nader a household name and prompted passage in 1966 of the National Traffic and Motor Vehicle Safety Act, which gave the federal government substantial authority in promulgating automobile safety standards. Nader went on to lead a band of dedicated consumer and social activists (“Nader’s Raiders”), who attacked a wide range of public policy issues. He also founded Public Citizen, a major advocacy group. 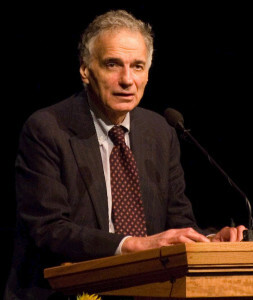 Nader ran for president as Green Party candidate in 1996 and 2000.